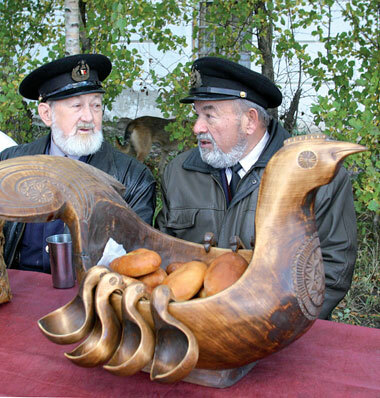 The autumn townfestival “Pomor New Year-Novoletie” takes place for 8 years in Arkhangelsk. 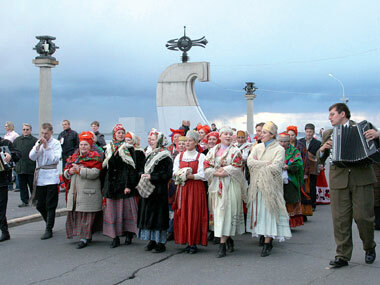 In this festival merge an ancient date of meeting Novoletie and folklore holiday of Arkhangelsk inhabitants. Pomor New Year is the Day of native Pomors of the Arkhangelsk Region, of native Pomors, Pomor's day. The main Idea of the festival - revival and preservation of culture, traditions and rites of Pomor Land. On the Year of Redemption 14 september 2010 we will celebrate 7519 Pomor New Year since the cteation of the world. 06:51 Meeting at the railway station, transfer to the hotel “Dvina” or “Pur-Navolok”, accommodation. Breakfast. View tour of Arkhangelsk “Arkhangelsk is the town with an Angel’s name” Arkhangelsk – the first commercial sea port, sea gate of Russia, opened the way to the West. The Pomor land has become the cradle of the Russian fleet and the tricolour was destined to be raised here. Excursion to the Museum of Fine Arts. Lunch. In the restaurant “ Bobroff”. Foot excursion along the ancient street of Arkhangelsk, Chumbarov-Lurching Street . Visit to the school of a folk trade (masterclass in birch bark, wooden and clay toy). Dinner. Meeting with the members of club “Pomor brotherhood”. 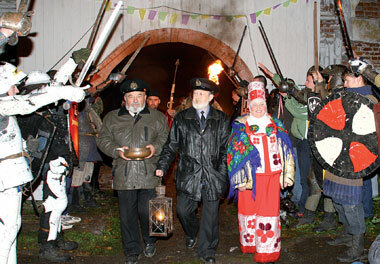 19:00-22:00 A festive rite, a kind of summing up of the year (performance of choirs, funny drinking songs, torchlight procession and burning of a straw Kila – symbol of the old year and setting fire to lightship of happiness; and pay symbolic gift to the Northern Dvina. Breakfast. Excursion to Malye Korely, the open-air museum of wooden architecture and folk art. A rite “Initiation into Pomor brotherhood”. Lunch. Excursion to the museum “Opening up of the Arctic” named af ter A. A. Borisov. 18:00 Dinner. Breakfast. Visit to Margaritinskaya fair, the largest in the Arkhangelsk Region. Lunch. Excursion to the village Zaostrovye There you can see a complex of two beautiful churches situated next to each other. Sretenskaya wooden church was built in 1688 and the stone two-storied temple – in 1876 and Severodvinsk – the centre of atomic shipbuilding in Russia. Dinner. Breakfast. Excursion to the museum of Local Lore . Lunch. Free time. Transfer to the railway station. Pomor New Year it' s a harvest festival and a summing up of what was done during the year. It's festival of fresh beer and fresh-baked bread. Every year last Sunday of June the city with the Angel’s name celebrates its Birthday. Visitors have the unique possibility to take part in the International street theater festival, carnival procession, side-shows. Sailing on the paddle boat “N.V. Gogol”, folk and pop shows are offered.